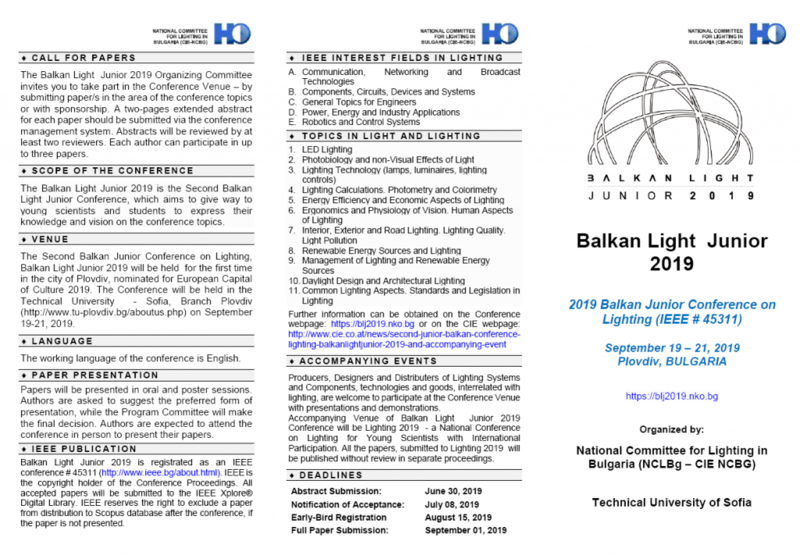 The Balkan Light Junior 2019 Organising Committee invites you to take part in the Conference Venue – either by submitting paper(s) in the area of the conference topics or with sponsorship. A two-pages extended abstract for each paper should be submitted via the Conference Management System. Abstracts will be reviewed by at least two reviewers. Each author can participate in up to three papers. 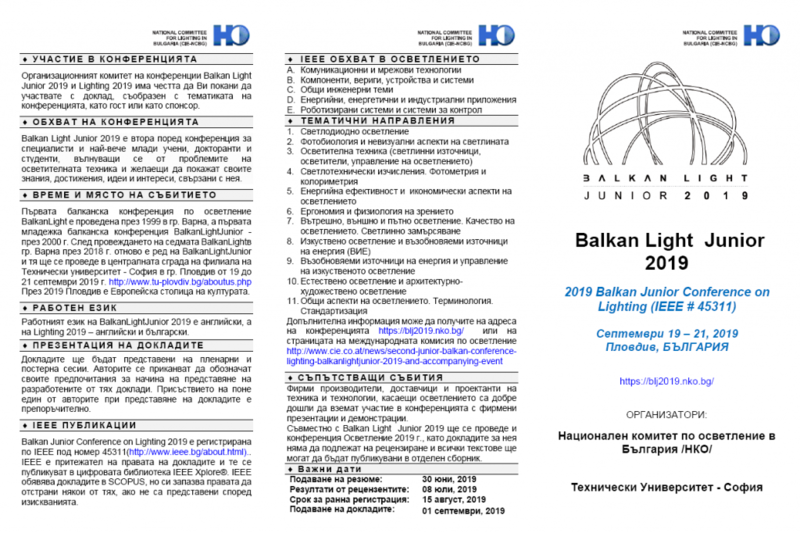 The Balkan Light Junior 2019 is the Second Balkan Light Junior Conference, which aims at giving opportunities to young scientists and students to express their knowledge and vision on the conference topics. The Second Balkan Light Junior Conference, Balkan Light Junior 2019, will be held for the first time in the city of Plvdiv, nominated for the European Capital of Culture 2019. The Conference will be held in the Technical University – Sofia, Branch Plovdiv on September 19-21, 2019. Papers will be presented in oral and poster sessions. Authors are asked to suggest the preferred form of presentation while the Program Committee will make the final decision. Authors are expected to attend the conference in person to present their papers. The registration fee of the Conference is 300 EUR and includes cocktail party, participation in all sessions of the conference, coffee breaks, Gala dinner, conference proceedings in print. For early–bird registration the conference fee is reduced to 200 EUR. The conference fee for IEEE and NCLBg members and young scientists is 170 EUR (if payed after September 1st). For early–bird registration in this case the fee is 150 EUR. The conference fee for students is 80 EUR. For early–bird registration in this case the fee is 60 EUR. The registration fee for students does not include the Gala dinner expenses. There is also an opportunity for poster presentation in absentia (authors cannot attend in person), which costs 80 EUR. Bank Account: IBAN BG85 BPBI 7940 1081 9901 01, NKO-Bulgaria, Eurobank Bulgaria AD, BIC: BPBIBGSF (name, country – for Balkan Light Junior 2019, Plovdiv). Manufacturers, Designers and Distributers of Lighting Systems and Components, technologies and goods, interrelated with lighting, are welcome to participate at the Conference Venue with presentations and demonstrations. The conference provides an ideal place for researchers to present the latest research activities and describe recent and emerging developments and directions in the field of lighting and lighting technologies. It aims at getting together researchers to exchange and share their experience and research results within (but not limited) to the conference topics. Participation in the conference is not limited to academics and scientists from the Balkan countries. Participants from all over the world are also warmly welcome. We look forward to welcoming you in Plovdiv on September 19-21, 2019!